I discovered a new format of Korean Nancy Drews today! It appears to be a spin-off of the Japanese Yomiuri Shimbun books which were produced late 1970's to mid 1980's. 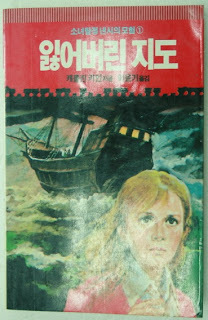 The Korean title translates to Adventure of Lost Map, which could indicate that the original story is Missing Map. However, the recycled Japanese artwork is from Wooden Lady, so possibly that is the source book. So far I have found 2 stories (the other one may or may not be Blackwood Hall) in this format.